Yesterday. At midnight, five thousand people crammed into the Plaza de la Constitución, in the old part of San Sebastián. 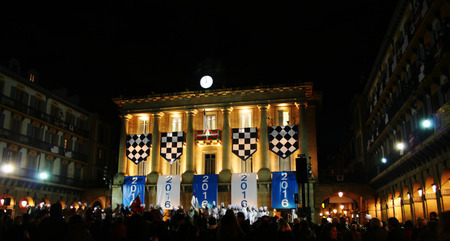 As soon as the clock struck twelve, the town flag is raised as the various tamborradas (groups, typically gastronomic societies, that play the drums throughout the city streets) begin their playing, which does not stop from 12am january 20th until 12am january 21st. Almost as big a tradition as the festival itself is the dinner the night of the 19th. We kicked it off South American style in my apartment. A goodbye to one American friend, and a hello to two new ones . On the menu? Puerco pibil, black beans with chorizo, quinoa with herbs, green garlic, and shallots. 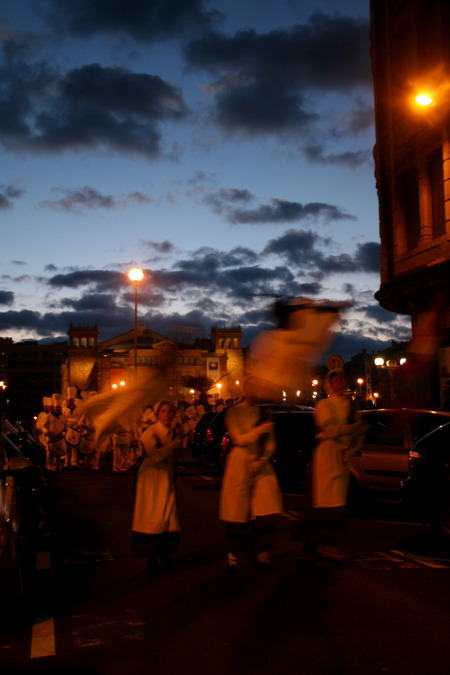 There's a lot of myth surrounding the tamborrada, which is, at its most basic, San Sebastian's patron saint day. Over 100 local gastronomic societies march through the city, all day long. They stop outside of bars and on crowded street corners to play mini-concerts (and are usually rewarded drinks from inside). They dress either as chefs or soldiers, supposedly to commemorate a time when folks in the hospitality industry chased after the troops occupying the city. Well, luck of all lucks, just outside of our apartment was one of the stops. Que suerte la mía! We were treated to a birds eye view of every group that marched through the city. They practice for several weeks before hand, necessary because many of the performances consist of dances and special songs. The majority play barriles, or barrels, but there are also tuba players, singers, dancers, saxophones...non.stop.sound. How to best sum up the tamborrada? Like a smaller, safer, culinary-themed Mardi Gras, with spectators happydrunk on champagne and pintxos, singing along to ancient folkloric music instead of clamoring for beads. Yeah. Now it's time to pick up the drumsticks that keep appearing around the apartment and dig in for a bleak fiesta-less February. Oy oy oy.